Foreword by: John C. Bell Jr. The core question of this book: how a great lawyer who comes to represent important causes, emerges out of the racist, paternalistic, and self-perpetuating establishment of rural Georgia in the 1950s? What about Tommy Malone led him to take on the power structure in his community and begin representing people who were injured against prominent doctors and hospitals? It wasn't money because there wasn't any money to be made at that time. There is nothing specific in his background that would cause anyone to predict that he'd become one of the first white lawyers in the Deep South to represent the black community and reach out to a struggling handful of African American attorneys and ease their passage into the mainstream. A kid who grew up in the Jim Crow era in Dougherty County, who went off to college--not an especially progressive young man--came back home after he finished law school and began representing African Americans against the ruling class? It just wasn't done. Somehow, this same young man went on to become one of the greatest trial lawyers of his generation, representing those who had their lives turned upside down--the catastrophically injured and the families whose loved ones needlessly lost their lives and futures due to the failures of others. The answers are as varied as human experience, but undoubtedly, Malone sensed a "guiding hand" directing him to the good. There was no teacher or mentor to illumine the path forward, just the gradual accretion of experience, knowledge, insight, and pain on a sensitive soul, kindling fierce passion and righteous anger. Viewed through this lens, Tommy Malone becomes a very important figure in the history of the South, and in some respects, the history of the country. It’s no accident that Tommy Malone is the perennial top vote-getter in the peer-reviewed Super Lawyers, year-in and year-out. More than 30,000 lawyers in Georgia and he’s always ranked number one. Tommy Malone is a giant of the legal profession, a giant advocate for the victims who became his clients, and a giant of a human being--father, husband, and friend. In addition to his brilliant mind and persuasive skills, it is his courage, fortitude, and resolve that enabled his legendary accomplishments. This is one tough man! 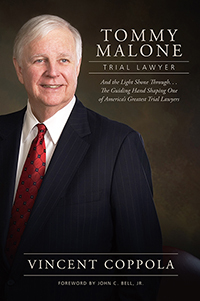 Tommy Malone is among the elite and most talented trial lawyers of our time. After meeting him over forty years ago as his opponent in a case, I knew then I was in the presence of greatness. Time has only confirmed my first impression. We will not see a talent like Tommy's again. Vincent Coppola has captured the essence of this great trial lawyer and fine man.